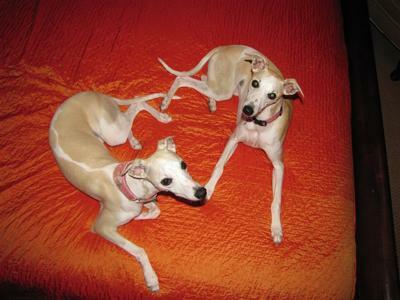 We have 2 whippets, Lily and Daisy. They are 1/2 sisters from 2 different litters. This was a rare moment when they actually laid next to each other. 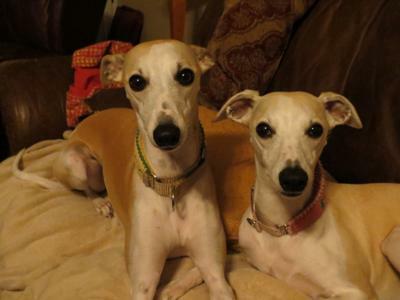 They get along great and play but they do not like to curl up together as I see other whippets doing. They were watching my kids decorate the tree and were so entertained. I always wonder what they think when we suddenly bring a real tree into the house. Does anyone else have a whippet that is a barker? Lily goes squirrel crazy and will sit at the bottom of the tree and bark non-stop. She even does a full twist in the air when in her frenzy. Daisy sits in the warm house and watches Lily watch the squirrels. 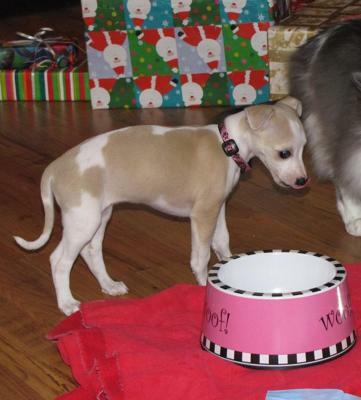 Looking forward to time off work and school and sleeping in with our whippet babies. Lily was our best gift for Christmas this year. While she is keeping us all busy she is wonderful and we love her! Our Christmas puppy is now 4 months old and doing great. She is so smart, she even rings a bell on the door to go outside. Who said whippets are hard to train? She has won our hearts! 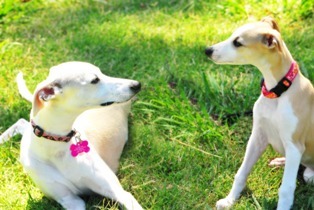 We have 9 month old Lily and now we have brought home a companion for her, Daisy. We just visited the breeder and picked her out. They are 1/2 sisters. She is very calm and sweet and pretty much sleeps all the time for now. Lily is learning how to play with her gently and doesn't seem jealous or concerned and has already shared food, water and toys. I hope it is the beginning of a long friendship. Our new little baby, Daisy, is already 10 weeks old and has grown so much. She can really hold her own with 10 month old Lily now too. The weather has been so nice here they really play a lot outside and then come in for those long naps. Daisy is 9 months old now and is going to be bigger than her 1/2 sis Lily who is 1 1/2. We call her Crazy Daisy because she has amputated many a barbie and polly pocket dolls. Anything not nailed down is fair game to go through the dog door and into the yard. She loves to be outside chasing anything and lounging in the sun and then she curles up for a long nap. She is much more into other dogs than into people. Daisy likes to sleep on top of the covers but prefers to have her eyes covered to block the light in the mornings. She is a crazy pup! 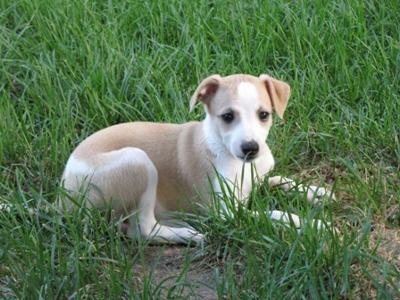 We had these pics taken at the park when my non-furry children were having pictures done. Lily is now 11 months and Daisy is 15 weeks but is more like 12 weeks in these pictures she is 9 weeks. They have a lot of fun playing in the yard in this nice Fall weather. Lily is 1 1/2 now and Daisy will be 1 in just a few weeks. They are so much fun and love to play and chase balls and each other. One thing they don't do is snuggle up together. They even fuss at each other if they get too close when trying to sleep. 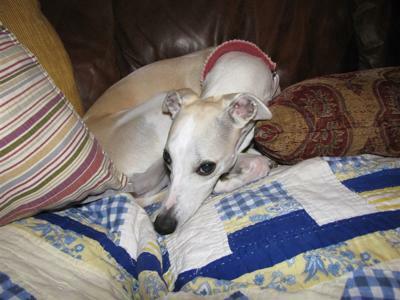 Not sure what that is about after seeing all of these adorable snuggled up whippet pictures. They sleep with my daughters so it works out. 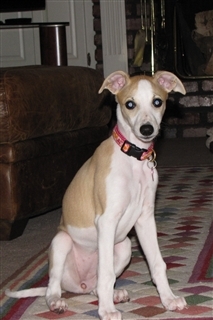 I too cannot imagine ever NOT having a whippet in my life now that I have experienced the joy and love they bring. They posed so nicely on my bedspread I had to go grab the camera. Lily is now almost 1 1/2! 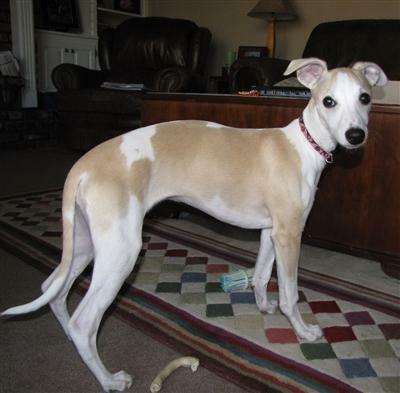 I really cannot imagine being without a whippet in my life now. 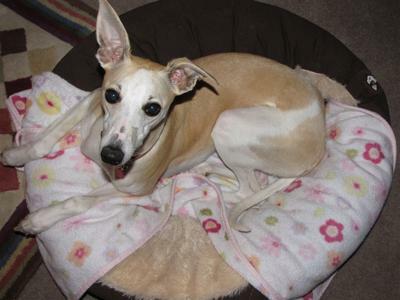 Lily is very sweet and gentle but can be very serious when arguing with her 1/2 sis Daisy over a tennis ball. It is amazing how she can bark with the tennis ball in her mouth. I am also surprised that she is somewhat of a watch dog and will bark at noises even in the middle of the night. Her favorite activities are chasing tennis balls at the dog park, going to visit each person at the dog park and napping on the couch or under the covers. What a joy!! 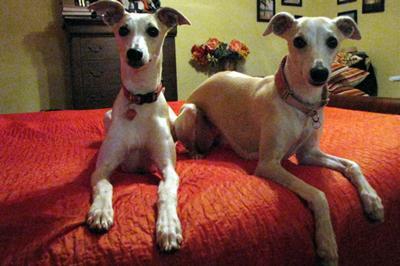 Here is a recent pic of my two whippets. Lily on the right is now 2 years old and Daisy is 1 1/2. They are half sisters with the same dad. We have had a rough few months. Daisy cut her paw and had to have a few stitches and Lily somehow slightly fractured her shoulder and had to stay on crate rest for a few weeks.